The Menagerie includes several instruments – as a former music major and band teacher I’ve worked to at least somewhat master a number of them. 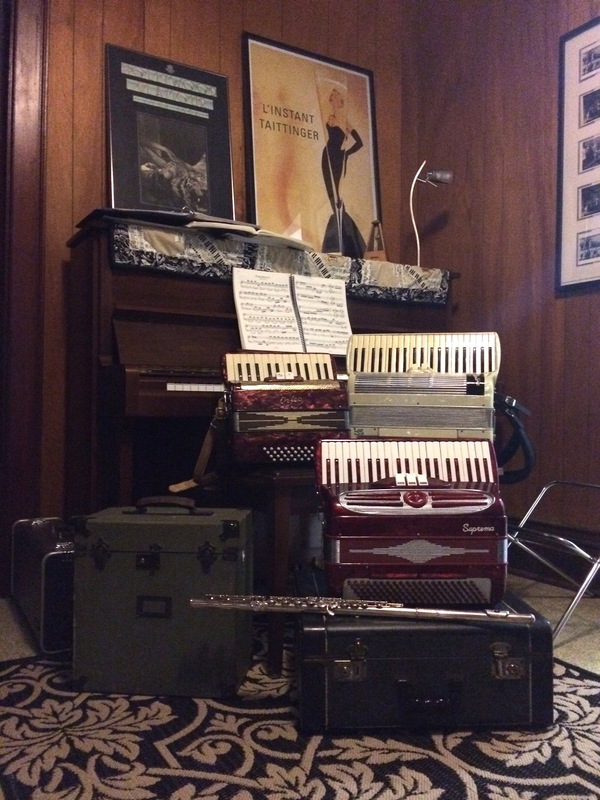 As someone of Swiss Heritage, accordions have been part of my family for generations. I’ve played piano since age 6 and still practice on a daily basis – from Bach preludes to Chopin waltzes. Flute entered the picture in grade 5 – my aunt had a flute, it was portable and fit in my school bag. Done. In high school I dabbled with oboe and saxophone and then in college took a series of “Fundies” courses where we learned the basics of how to play each instrument in the woodwind, brass, and string families. Just like people, no two instruments are exactly the same. Musicians don’t really talk about it as, when we do, others give us that vacant stare. The one where it’s clear they think you’re a little off and they’d rather watch paint dry than listen to you ramble on about the intricacies of a certain tuning or the depth of a fingerboard. Glazed eyes, slack jawed, clearly in their own happy place, which does not include you or whatever you are talking about. Given the chance to play multiple instruments of the same exact year, make, and model, a musician will notice subtle differences in the feel and the response of each one. They each have their own personality. One piano may have a lighter action with a bell-like right hand and quickness that allows the player to flit across the keys while another may be stiffer and more suited to more bombastic playing. A saxophone may have a brighter tone that cuts above the rest of the band, no blend in sight. Certain notes may sing more than others, some keys require a bit more pressure for closure. Playing is personal, intimate. There’s an emotional connection, a visceral relationship. As you play you lose a part of yourself, from the breath needed to produce sound in a wind instrument to the skin cells you leave behind. Guitar players and string players build callouses. Violinists and violists sport bruises on their necks. Pianists hunch over their keyboards like T-rex dinosaurs, permanently changing the curvature of their necks and upper backs. Each time you play, you contribute to the death of the object. Your fingers press into the fingerboard or stroke the piano keys, wearing against them. Just as you deface certain letters on your laptop keyboard, your habits can have the same effect on an instrument. Have you ever seen Willie Nelson and his guitar Trigger? He’s worn an actual hole in the face of the instrument. Photo from BBC World Service digital collection of 50+ firsthand accounts of moments during World War II. Music-making is a shared language, a part of one’s cultural identity, integral to the sense of self and of belonging to more. How many times have you seen a vintage photograph where you notice an instrument in an unusual setting, something outside the norm of a concert, a tavern, or a family gathering? Soldiers around a campfire or, as pictured here, celebrating. Where and how did that instrument travel through the countryside? Immigrants at Ellis Island with a carpet bag in one hand, children in tow, and a violin case in the other. Facing an unpleasant journey of thousands of miles by ship they’ve included an instrument as one of the cherished belongings that would accompany them on the voyage. My Grandmother’s parents immigrated from Switzerland. Her father, a cheesemaker, played button accordion, yodeled, and sang songs. Steeped in musical traditions, she learned keyboard accordion at a young age, having studied with Wisconsin legend Rudy Burkhalter. As a young girl she traveled the state with his youth accordion orchestra, crisscrossing the countryside in an airstream bus. We started lessons when I was five years old. As I became more proficient we moved from the Seldon Accordion Method to learning actual charts, many of which were copies of her original sheet music from the Burkhalter Band. 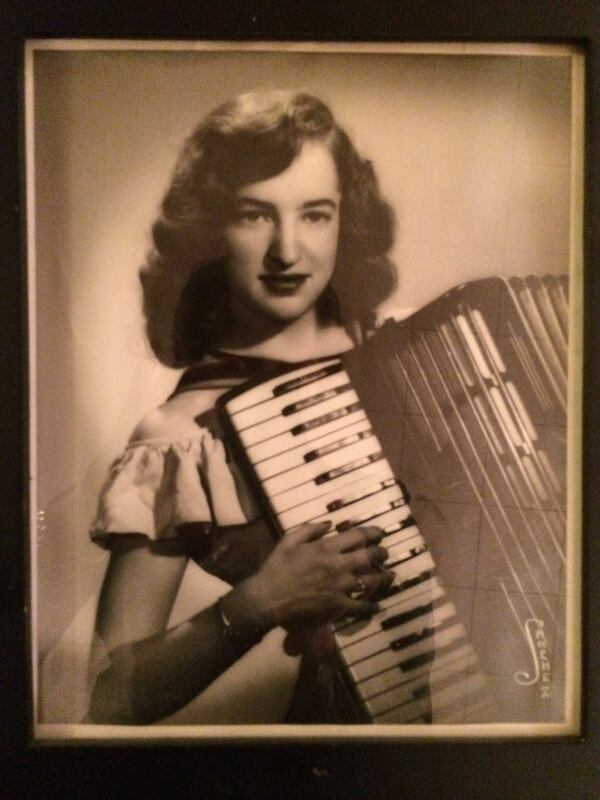 Every family holiday was a chance for music-making from my Great-Grandmother’s harmonica playing and singing to singalongs and dancing to Grandma Ruth’s accordion music. Each year included multiple visits to “The Old Folks’ Home” in New Glarus and Labor Day Weekend parties at The Big Farm as part of the annual Wilhelm Tell Celebration where 20+ friends would congregate to make Swiss music, polka, and share stories for one glorious weekend each year. My continued obsession with accordions stems partly from the fact that with each passing year they become more rare, closer to extinct. The manufacturers who boomed in the 1940s, 1950s, and 1960s have long since faded away. The knowledge of how to build and how to repair dwindles as the skills of the master craftsman pass away undocumented for future generations. Here’s a detailed article on how accordions are made. It’s an incredibly complex instrument, a portable organ with reeds, mechanical keys, bellows and more. Banks of tiny reeds are activated by moving the bellows and forcing air through the chambers. By mechanically pressing the keys and buttons, you manipulate the pitch. Beyond that, you can use air speed to change dynamic level and overall tone. It’s a feat of engineering – I might have actually enjoyed science class if we’d been able to learn how a machine like this operates. Check out this “What’s inside your accordion?” video by Lou Jachlich to see the inner workings. Though much maligned, the accordion is the rare instrument that brings together multiple cultures and is appreciated and enjoyed by generations. In 2003 I had the pleasure, a top the highest “mountain” in County Kerry in Ireland, to sing “Red River Valley” with an Irishman who happened to be seated at the feet of a statue of the Virgin Mary. Later in 2005 in Italy it was a version of “Musetta’s Waltz” with a street musician in Florence. A visit to the Museum of Carnival Arts in Paris was that much brighter due to the band that was playing in the courtyard.